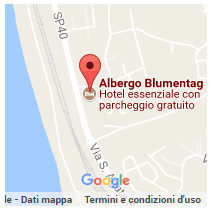 Blumentag: Hotel-Residence in Paola - Calabria, the city of San Francesco da Paola. We have 40 rooms, divided into several types, in order to facilitate the guests in a choice that best suits their tastes, desires and needs. Furnished with simple elegance and functionality. Each has a private bathroom, TV, minibar, individually controlled air conditioning / heating, safe, telephone (in-line) hair dryer, bath amenities kit. Located on the first floor, by the sea, with balcony (bathroom without bidet), mountain side with window (bathroom with bidet). Room dedicated to handicapped people. 2 Apartments with equipped kitchen (4/5 beds). 3 studios with kitchenette (2/3 beds). Any (4 to 6 beds). Children up to 3 years (free) if in bed with parents.